All businesses need to promote themselves. Internet marketing simply means promoting your business on the internet. However, if you do not have a business, this is a good way to make a business online. There are several ways internet marketing works. Basically you have to either have your own product to promote, or promote someone else’s (this is also called affiliate marketing). You can also setup a website and put paid advertising on the site. This way if anyone clicks on the ads you will get a small amount of money and while this doesn’t sound very lucrative, the ads clicks add up and you could end up with say one to two thousand dollars a year from just one website. With affiliate marketing you need to find a product or products to promote. To this end you will need to check out companies that are setup to help you do this. Clickbank.com, for example, offers digital products for you to promote with your own special Clickbank code. You will be able to research products on their website and also find out how much percentage of the sale you will earn. You can go to the website that promotes the product to check out their sales page. This way, if someone clicks on your affiliate link on your website with the Clickbank code, that visitor is immediately taken to the original website’s sales page promoting the product in question. 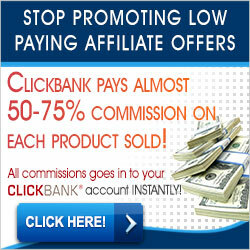 While Clickbank is an option, you can also find other companies that do the same. Commission Junction, for example, promotes products in the same manner as Clickbank but they are offline products like juicers, clothes, even furniture. Another way to look for products is simply to type in the product you would like to promote plus affiliate program into a search engine. This way you will find companies that offer their own products for sale and you can help them sell them online via your own website. Of course, for this all to work you do need a website. Today this is not a hard thing to do. There are many companies in the internet marketing niche that will offer you website setup services and many more services, like getting traffic to your site, etc. Once you have your website setup, you need to write content about the product. This should be unique content. You can write it yourself or hire a writer to do it for it. Services like e-lance or fiverr or ineedarticles.com are some of the places to help you do that. Then you need to add your affiliate links into the content and you are ready to go. All you need now is visitors to come to the site! This again is another whole chapter. You can get visitors by posting on forums in the niche with a link back to your website. You can write articles about the product using relevant keywords and post them on article directories. You can also use social media, like Twitter and Facebook. If you are diligent and do this correctly, you may have an nice income stream from internet marketing. Be patient and don’t give up your efforts.